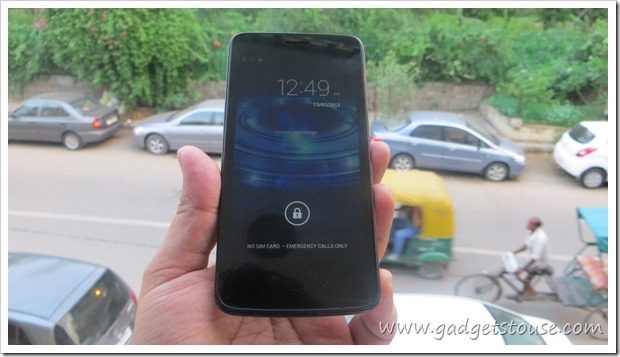 Xolo Q700 is a decent phone with really powerful battery for a price below 10k with latest version of android available and the phone might have a small display but does offer a good form factor and great build quality as well, find out more in this review. The build quality of the device is fairly good with rubberized matt finish back cover with rounded edges which makes it easy to hold in one hand and the display size is right for people who don’t want the display to become to big on their that the one handed usage goes for a toss, this phone on the other hand is nicely design to fit your palm with decent size display. 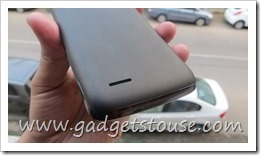 The form factor is good and weight of the phone is around 150 grams which is also fairly light for a device like this. The display is IPS LCD display has fairly good viewing angles and pixel density is quite right so that you wont see pixilation on 4.3 inch display. The in built storage is 4 GB out of which you get around 1.89 Gb user available and you also have support for MicroSD memory card with the option of installing apps on the memory card but you can move some supported apps from the phone memory to SD card not all. The battery backup is around 1 day with moderate usage. The software UI is stock android and device performs quite ok the gaming front as well, the benchmarks scores are given below. 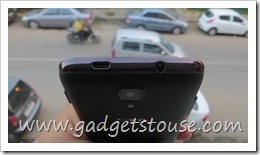 The rear camera is 5 MP shooter which performed good in day light show but the shots taken in low or less light had certain amount of softness in them. The front camera is VGA FF but quite ok for video chat it not too good in quality and details. 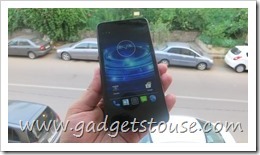 Xolo Q700 is a good device comes with great specs for a price of around Rs. 10,000 and good battery power and it does offer a good value for money, the only thing uncertain is the support which if you need may not be that good as you might expect. We have just corrected the review, you can move apps on external memory card but cannot install apps direclty on it. i have used the phone for about 2 months now.. one of the best smartphones for its price range. 1 reason you should not buy this phone is services, awful and it has a very delicate glass for digitizer touch screen that can break easily on dropping! mine did and now 1/4 the glass surface does not work..
touchscreen digitizer is avaliable on ebay for Rs 2499/- but i went to a service centre in laxmi nagar delhi they are charging Rs3000/-. thats too much costly…..anbody please suggest me what to do now….should i buy the touchscreen digitizer from ebay? 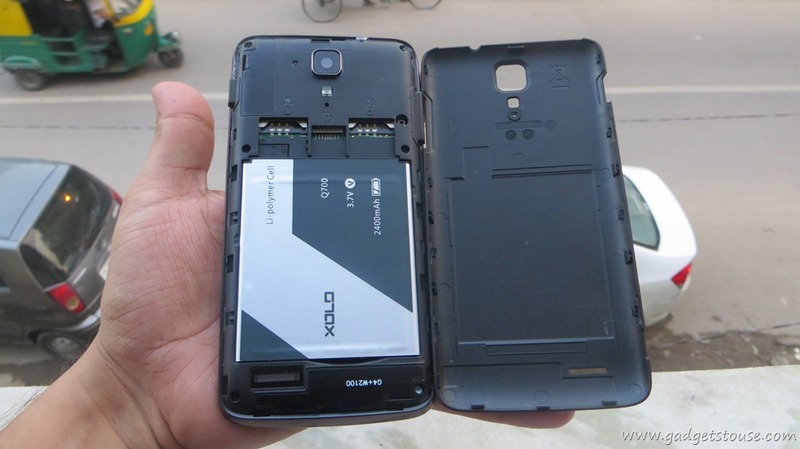 Hi Sir, you said that we can install apps on SD card on this phone, but most of the reviewers said that this is not possible, and even Many users are saying that installing or moving apps to SD card is not possible on this phone, this is the same issue with Xolo Q1000, though Xolo Q800 can install or move apps to SD card…….. So can u please check this again……. We have just corrected the review, you can move apps on external memory card but cannot install apps directly on it. Could you explain why we cannot install apps directly on the memory card ? Hi, Could you please confirm whether we can move apps or install apps on external storage?In ur review u have mentioned we can however I have heard we can not…..
because the os options does not allow you to do this on this phone. Even moving the APP to SD card is not allowed in this phone. We will cross check for the same, once we have the device back with us. 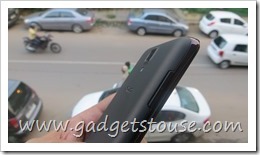 Plzzz make a gaming review of XOLO Q700…..
And which type of game we can play on this device ? We got the device much late and there are many gaming reviews done for this online, we decided not to do the gaming review of this phone and more over the review unit is not gone. One more thing is that, is it support or compatible OTG ?…..
yes it does support OTG with that cable. You can also connect your mouse or keyboard and use it . Tried this. Is it support OTG cable, is there LED notification blinks only red light or other colors and can it really play high end games like NOVA 3, Asphalt 7 etc…..
My English is poor, hope you understand it….. Please reply sir, it is very important for me………. but where is your question ? 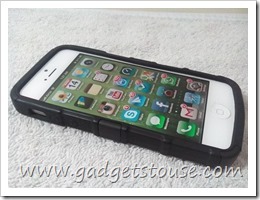 Keep it up, thanx again…..
You can watch the video review – we have done the OTG test as well. Yes there is a notification light but looks like the color cannot be changed, we will confirm this later. It can play some graphic intensive games but its limited the small internal storage. sorry to say but your review is not useful in any respect. 2. you can’t instal app to sd neither move. moving application is not available without rooting. even after rooting you can just link to sd. i m using q700 from 2 months. overall its best mobile in its price range but app to sd is missing which is needed. 1. we have written about the user available memory for pictures videos and other data than apps. 2. yes you cant install apps on sd card and we have corrected the review for this. 3. you can also use a 64gb card – we tried and it worked. 4. bluetooth 3.0 it is – thanks for pointing out we have corrected the same. Can you please guide how i can move the apps from internal Memory to SD. 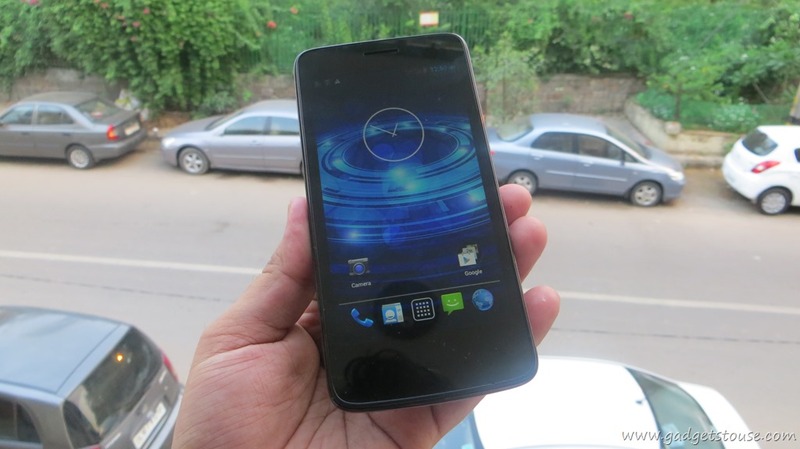 I have bought the item “XOLO Q700” (231029867639) thru ebay and it has been delivered to me on 16-Aug-13. I have started using the same for the last 2 days. I found the speaker is not at all effective and more over recorded voice is not also not that good. Other wise, the phone is excellent. The browsing and down load speed and most of the function is also good. I am very disappointed with the Voice clarity and Audio quality and volume. Could you please give me the solution ? Is it the Q700 mobile problem or only my phone has this issue and can be rectified?. Kindly suggest the near by Authorised Service centre of Xolo, so that I can get in touch with them. I am in Kolathur near DRJ Hospital, Chennai. does both sim are active? i mean if we use first sim for data then is it possible that second sim recive calls at d same time?? sir,tell me only 2-3 things abt this phone i.e. battery backup and internet speed does both sim are active? i mean if we use first sim for data then is it possible that second sim recive calls at d same time?? Most of the dual sim android phones are not capable of making both the sim active at the same time, so only one of the sim is active at a time and in case you get the phone call on the other sim card it will get routed to the sim card which is active. hey!!! i want to buy this phone but i have heard that there is a glitch in 4.2.2 jb in xolo q700 update !!! is that so ?? kindly please rply to my email mentioned above !! you can checkout the camera samples given in this review under the camera samples heading. you can use some apps like Apps2SD but this device may not support this for all the apps. 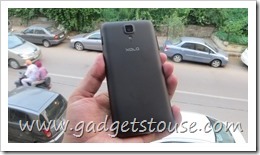 I have bought the item “XOLO Q700″ (231029867639) thru ebay and it has been delivered to me on 16-Aug-13. I have started using the same for the last 2 days. I found the speaker is not at all effective and more over recorded voice is not also not that good. Other wise, the phone is excellent. The browsing and down load speed and most of the function is also good. I am very disappointed with the Voice clarity and Audio quality and volume. i have same problms in xolo q 700.sound and voice clarity is not clear.second dayafter purchasing,now my set is in service center. 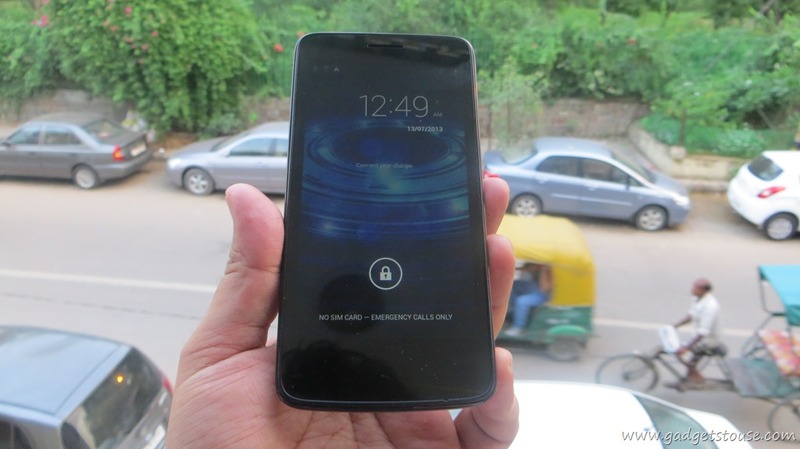 Sir pls suggest me, Which phone I should buy Xolo Q600, Q700, Q800 or any other 10k Quad core ? Your opinion important for me sir…..
you can go for Videocon A55 HD, Canvas 4 or lava iris 504q in case you dont want xolo phones. Zen ultraphone 701 HD is also a good choice. we cant tell you the best, but you can decide the same reading our full review. thank u so much sir, can u pls help me to choose best mobile among these..
we haven’t reviewed iball devices till now so cant comment, however micromax canvas 2 110q is quite good but does not seem to be a value for money device. Twice I have posted asking for reply. You have not replied. What is the reason? One more Problem I am facing now is that, when ever I get a call, my screen display goes off. Why?. I have checked complete settings. Still I am having problem. Could you please reply to all my queries please..You have been replying to others except me…Is there any thing behind? Kindly suggest me, which is good buy? 504q or Micromax a116hd. I want to make video calls through sim card. kindly suggest me, whether above models available with video call through simcard? Both of these phones are equally good and have nice unique features. 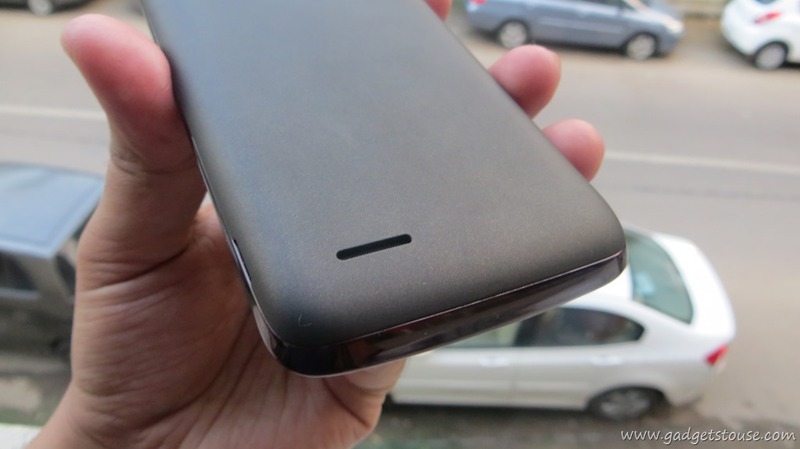 we suggest you read the full review we have written for these phones to take ur decision. 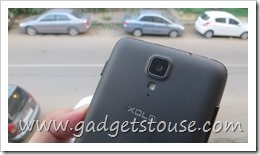 Sir which is best Xolo Q700 or Lava Iris 504q….. Both are good, let me know what key features matters to you. I also like both of them, but what you think about both mobiles as game wise, and look wise……. Gaming wise Q700 is better and look wise and weight wise Lava 504q is better, you can decide what is more priority for you. Thanks sir, So I am go for 504q…..
=> which will be best Phones among (Xolo q800) vs (Samsung GalaxyCore) vs (Sony Xperia M) ?? => among Xperia M & Xolo q800 , whose battery lasts longer considering fact that Im not much Gaming user.. I want to know more about 3g speed as sometimes mobile shows E, H and H+….basically my question is suppose if a handset support up to 7.2mbps speed and another mobile support up to 42mbps speed then does it mean second phone will give faster speed or it is depends on service provider?? i mean now days some phone coming with up to 7.2 mbps speed and some up to 42mbps so what does it means??? will 42mbps support phone give faster speed compare to 7.2 mbps speed phone or will both give same speed???? You do not need to worry about this signs. The signs stand for the network and the standard by which you are currently on the network. G stands for GPRS and is the slowest standard, used is the GSM network (2G). E is an extension of GPRS, it is called EDGE and it is correspondingly a little faster, but still uses the old GSM network (2G). 3G stands for UMTS and is the successor to the GSM network and faster. H and H+ are standing for HSPA and HSPA+. Both use the UMTS network, where H is faster than 3G and H+ is faster than H.
Now if the phone specs say that it has 7.2mbps or 42 mpbps that means these are the max speed rates which are supported for these phones if the cellular network offers this much of speed. I hope I have answered your question, let me know if I missed anything. sir my second question is about android software version….how a phone update from 4.1 to 4.2 version?? can we update all mobile having 4.1 to 4.2 via software update feature…. pls also explain update requirement. suppose i buy a mobile with android version 4.1 an older version..then will i able to upgrade it’s version later??? software update for android phone is normally pushed by the phone manufacturer but again it does not happen for all the phones. So if a phone runs 4.1.1 and 4.2 is available for that phone and if manufacturer has pushed it over the air means that you can update the software on your phone using wifi or 3G. So whether a phone will get the future update will depend on the manufacturer not the phone. we will confirm that soon as we might be getting it for review very soon. Sir,i would like to buy a 10k device…i am a moderate gamer,net user..dont calls/music often ,i want a fast smartphone..with less negative options..i wud like to go with xolo q 700/mmx canvas 2 plus…wats ur opinion.. Both of these devices are good but performance wise q700 will be better and build quality is also slightly better and although moving apps from phone memory to sd card will be a problem. we will getting it for review soon, stay tuned. Im confused between X910 and Q700,, plz help which one should I buy.?? 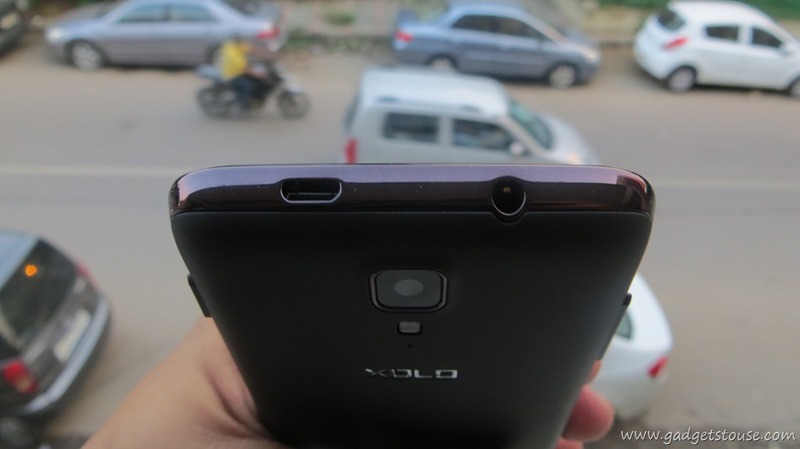 Xolo Q700 is a good option but we cant comment about x910 as we havent reviewed it yet. we havent reviewed xolo x800 so cant comment on that and also for the cost of xolo q700 and canvas 2 plus please check it online on commercial stores like flipkart. Thanx sir..xolo q700 is pricd around 10k..and mmx canvas 2 plus around 13k..
Canvas 2plus performs better in gaming right? we are not sure that it is possible with a future update, and we havent reviewed canvas 2 plus so cant comment much about it. Does it support apps on SD card ? Tech Junction says it doesn’t. yes you cannot install apps on the SD card. Abhishek, Some users have mentioend that you cant even move the apps from phone memory to the sd card. Can you please confirm the same? So incase if I am able to move the apps to sd card post intalling them on phone memory, my installation is than not constrained by the limited internal memory? Or does some files related to the app still remain on the internal memory? I would request our readers to help in this case as we havent experienced after sales, all those xolo product buyers please reply with your inputs, thanks. you can use quadrant standard and select system configuration. I couldn’t find it. Is it there in the settings? Could you please tell me the procedure to check it. Quadrant standard is a free app in the app store its not the phone settings. Hi. Can you tell us what 64 GB sdcard you tested with (the brand name and class)? I want to purchase one and thought to go with something which is tried and tested. Thanks! we tested it with sandisk 64Gb microsd card. sir,does the device lag..heatup..on gaming..?does it have touch problem while charging..Will it last for more than a year..how is the touch response..what is its retail price? it does heat up during heavy gaming but its not much to make it uncomfortable for the user to hold it. Touch problem charging occurs some times when you connect high current charger to android phone but we did not faced any such issue on the unit we reviewed. It can be used for years provided you take care of the device as in handling and adequate charging at times when required. That means you do not have OTG support on your phone. pls tell me how to get symbol of missed call and unread sms. cause i dnt get such notification on the opening pate of the mob. we did not faced any network problem on the unit we reviewed and internet browsing is as good as you will find on any other android phone, its quite good value for money phone. 00 value for money or not? you cannot move apps from the phone memory to sd card. Planning to buy this phone. 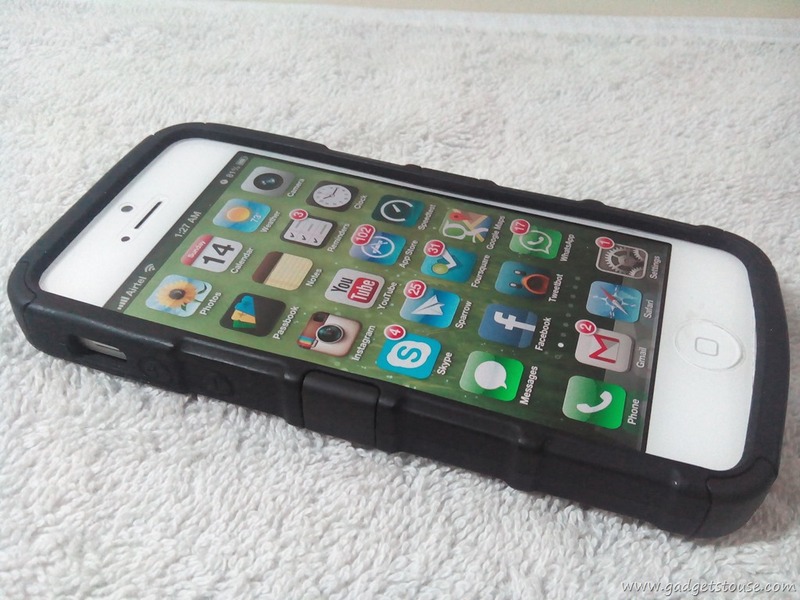 Your review say it has the mt6589 chip. But it comes with mt6589w-m as i’ve seen in the box. Can the mt6589w-m play full hd in Mx player software mode? earlier the mt6589m could do so. Thanks for pointing out it will be corrected, it seems to be a typo error, we have tried playing hd videos on this device it does play 720p just fine for 1080p videos you can use MxPlayer. We have tested the OTG support on this device, it was working on the unit we tested. 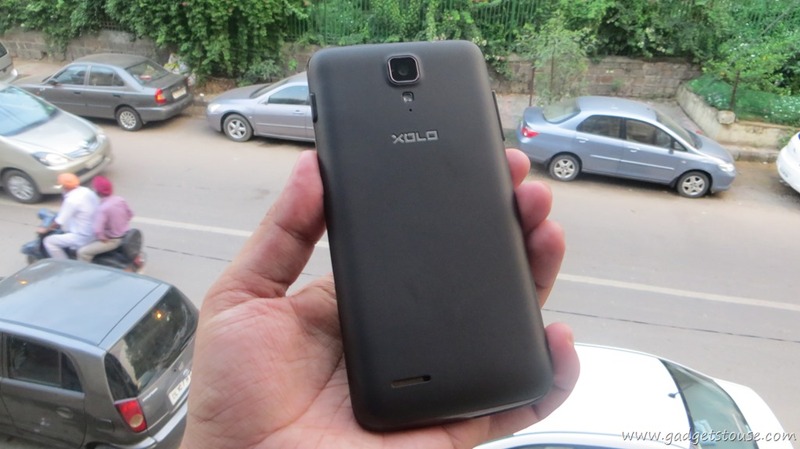 i using Xolo Q700 for 1 week its excellent…..will xolo q700 get the android Kitkat version….right now it s not released…i just want to know this… for this i asked this question……plz give the android updates for Q700…because most of the people buying Q700….so please consider this…. Xolo Q700 will not get the Kit Kat update, it might get the next 1-2 updates but it wont get the kitkat for sure. thanx Abhishek ji..i m lookng fward to buy the phone..
Touch response is good and OTG works well, let me know any of ur specific questions abt this phone. Wat r the aspects shud i consider b4 buying ths fon? I hvnt usd an android yet.i use nokia c5 03 nw and hv been using it for 3 years..now ma phone is outdated..and is almost dead..my budget is approx 9k..
Xolo Q800 and Xolo q700 if u want an android phone. Nokia Lumia 520 is you want a windows phone. 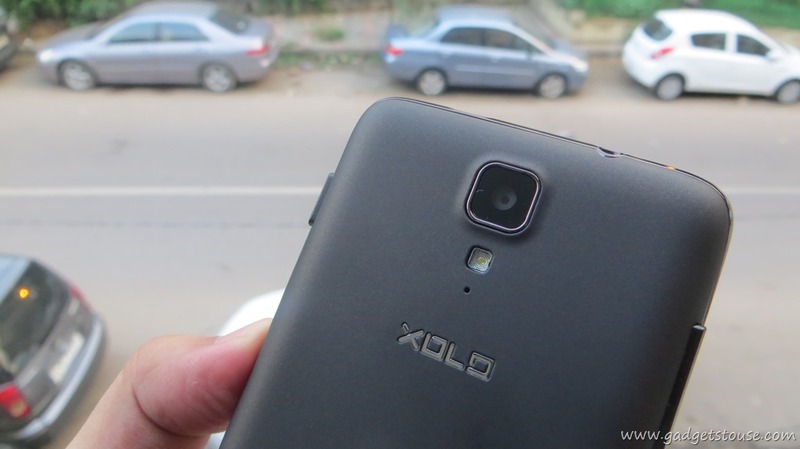 How to use WiFi Direct in Xolo Q700 to send the files directly by wifi. We suggest you use Super Beam from market, share the file using superbeam and it will generate a barcode, scan this from superbeam in the other device and it will automatically enable wifi direct and start sharing the file. all these phones are good, we can tell you the best if you tell us ur requirements. Hi, can this phone move apps to SD card after installed in internal memory? Does it play HD videos? internal memory is enough ? No it cannot store apps on the SD card. It can play 720p videos without any problem on this device but 1080p videos will not get played in default video player, but you can play them on mxplayer. The in built memory is not much, in case you want to install games, for app usage it is decent again not too good for pro users. Can we move apps to SD card after installing in the Internal memory? it can play Hd videos at 720p but cannot play 1080p videos. I wanted to know is 2.70 Gb of usable space in internal memory is sufficient. And how many apps can be stored in that space as apps can’t be moved or installed in Sd card or is there a way to do so please reply looking to buy this phone. for apps this much of memory is quite sufficient as normally apps are not too big in size, but apps cannot be installed on Sd card on this device, this device will still be worth the money you invest, but if you increase ur budget you can get Zen Ultraphone 701 HD for around 10-11k with better specs and bigger display. my budget is short not more than 8500rs in that will xolo 700 is worth and wat about the service of phone as there are many users complaining about xolo after purchase service is it ok to purchase it or go for any other branded phone(Samsung Nokia or Sony or Micromax) which may have lower configs in same budget!! After sales services is not good for xolo and we have the same feedback from not all but many consumers. So in that case, if that matters to you then we suggest you go for Sony, Samsung or Nokia devices at this price which may have much lesser specs and features but they will last long and after sales support for these brands is much better. Is q600 is not able to store apps in sd card or install is there is difference between the camera of both a500s and q600 also wat about the battery life which is better in that aspect. is their any problem with the audio quality of this device?? as read in some comments it goes down after some time. cn we use apps like app to sd to trasfer apps to sd? audio is good as you might expect in a budget android phone, however its not too loud and you cannot install apps on the SD card on this device. I visited XOLO mobile phone website but unable to find XOLO PC suite. Please tell me from which site I can download Mobile PC suite. So that I can connect my phone to PC and share data and application easily. all these phones are good, tell us your specific requirements so that we can help you better. I m goin to buy Xolo Q700i soon. 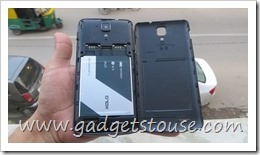 I like to know what is difference between xolo Q700 and Q700i from the point of view of performance. Another thing is is this device heat up in lil span of time while watching videos. I m not much game lover but i do use mobile for quick photography. and most of the time use for watching videos and bit chatting. So please suggest me is this device really worth to buy. Also suggest me other device in price of range of 15K. 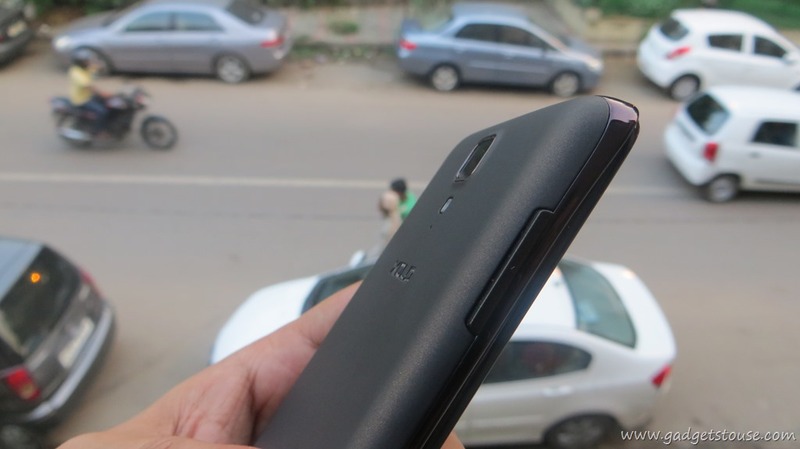 I am using xolo q700 from last 4 month i have purchased it from ezone, the problem is the battery of the handset is swollen and the back cover has come out in just 4 month. In most of the cases, battery warranty is around 6 months so get it replaced from service center if possible. I have bought canvas turbo and using 2g & 3g sim on it. i use 3g sim for data but when i receive call on 2g sim it deactivated data on 3g for entire call duration and as soon as i put the call down data again starts. pls let me know why it is so. thanks for your comment but I can receive calls on both the sim simultaneously and can juggle between call on both the sim. that means this is dual active functionality. I have tried this on my xolo Q700,first thing is that you have to root your device by any tool, i used baidu.Then install Link2sD and link all the apps to sd easily and quickly.but beware do it at your own risk because when i tried it first time it deleted my all the installed apps.you have to also partition your external sd card for which you have to use another android device,because for partition process unmounting is required which is not available on xolo q700. the method given above is for ‘moving apps to sd in xolo q700’. I am quite happy using xolo Q700.just wanted your guidance in the manner in which photos can b transferred frm cell to pc…actually facing this prob since long…..tried all options …the exact prob not known….plz help….